Family Time is Better at the Beach! Spending time at the beach is a perfect way to enjoy family time and explore the coast. Learning about nature and animals is much more fun when you can see them in their natural habitats. You will find endless opportunities to be captivated and amused by the local critters! 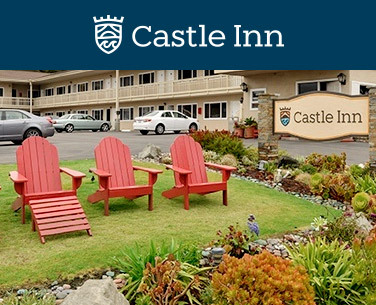 Your family will enjoy the pool and adjacent hot tub at the Castle Inn as well as our large lawn. 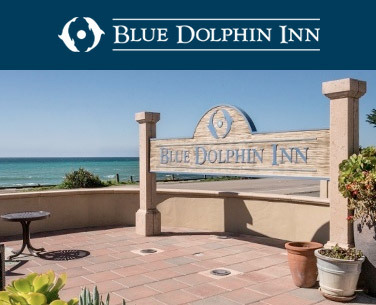 Play a game of bean bag toss and enjoy spectacular sunsets from our lounge chairs on the lawn. When you are looking for a playground for the kids to run around and play, visit Shamel Park. The large lush lawn is perfect for fun and games. Grab a picnic table and enjoy some old-fashioned fun while the kids play on the swings and slides or swim in the (seasonal) pool. Right behind the park is beach access so you can spend the day letting the kids run wild while you enjoy the beauty of this location. Plan ahead and take them on a tour of the Covell Clydesdale Ranch. Private tours can be arranged to visit this large ranch with massive pine forests and massive Clydesdale horses. The beauty of seeing these larger than life animals running freely is breathtaking and inspirational. This historic ranch is privately owned, but tours can be arranged. From zebras to sea otters, there is a lot to see. 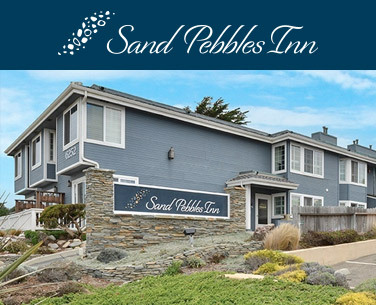 Starting with the tide pools right across the street from our family-friendly Castle Inn, your children will marvel at the tiny sea animals that emerge at low tide. From miniature sea stars (starfish) and hermit crabs to anemones and sea snails, the mesmerizing community under the sea comes to life. Children (and adults) have been know to spend hours observing the goings on in the tide pools. In the area just offshore, you will find many of the ocean’s beloved animals. Sea otters and seals can be spotted on the rocky outcroppings and the kelp beds and catching a glimpse of a dolphin or whale is always possible. There may even be an occasional elephant seal on the beach, so be careful to always keep your distance! To really see some elephant seals, a short drive north to the official rookery is an amazing look at the life of these giant creatures. The seasonal community allows us to watch all of the cycles of life from mating to birth and then seeing the babies grow up and leave the beach. Leaving Cambria to the north, keep an eye out for the wild zebras. Yes, zebras! Once a part of the Hearst Castle zoo, the descendants of those original animals have found a home on the ranch. There are several restaurants that are perfect for your family. Enjoy the burgers and barbecue at Main Street Grill or the West End Bar and Grill near Moonstone Beach Drive. If you prefer a sit down experience, try Linn’s on Main Street, (We hear no kid can resist their mac and cheese or chicken pot pies). The Old Stone Station features steakhouse cuisine and excellent clam chowder and a kids menu. If you need to stock up on snacks we have two grocery stores for your convenience. The Cookie Crock is a full-service grocer and Soto’s True Earth market caters to specialty items like vegan products and organic produce, with a deli opening soon for those picnic lunches. And what kid doesn’t love pizza? JBJ Round-up and JJ’s have everything you want from a pizzeria. For family style Italian at reasonable prices try Lombardi's. Feeling like Mexican food? Las Cambritas has outdoor patio seating.